Patsy is looking so grown up. She is crossing that imaginary line into young adulthood. A date at Subway would have been a big splurge for me. I remember dates at Costco for the $2hotdog and pop special. Ha! Nice post. I seem to forget omelets as an option to take care of veggies needing to be used, thx. I had my first salad from my gardens last night. Good timing, too, since the asparagus is just about done and nothing else is ready. Organizing a pantry is always challenging. Both here in my tiny apartment with just me and was also a challenge when I had my house and family. I, too, would lose stuff. Mostly because my ‘pantry’ was all over the house. A little bit in the kitchen, linen closet, bedroom closet, basement. And also because my many helpers at the house would put things away. Will Rob be able to work at all this summer? Rob will work part time this summer, as will I, working as personal support workers for my niece and nephew. Last summer, we did not care for Michaela, our niece, at all, because it was not needed. This summer, there are 2 days a week that both kids need assistance. So, if we both do it, we can each bill up to 8 hours per day (whatever is needed that particular day). And, both of their hours are increased because it’s summer, so there are more hours available this year. And, when their mom works, it’s long, long hours. So, on those days, we will both work, one of us for Jake and one for Michaela. Then, we will have Jake for an additional day. So, that makes 5 days of work between the 2 of us for starters, and then we will add in the occasional weekend days, the times when their parents are out of town or have extra work or meetings, minus the times when they are gone on vacation with their parents, and so forth. We spent about an hour making a very detailed schedule, with some flexibility built in so we can change things if we need to, but at least we have a starting point for the entire summer. Since Michaela graduated from her school program, we have great plans to keep her involved in the community, exercising, doing chores, and so forth on the 2 days that we have her. Her mom, dad and big sister will do the same on the other days. Jake needs a structure as well. Patsy thrives on structure, also, and so will benefit just by being around the program we are planning. So, we are planning trips to the YMCA for exercise and swimming, taking Michaela to 50+ to help with the Meals on Wheels program, as she had been doing through her school, to the CROC center for exercise and swimming, to the zoo, a train museum, endless parks and picnics, gardening in my back yard, a chore chart with trips to the Dollar Store for prizes, walks to Circle K for icees, crafts galore (like painting rocks for the flowerbeds and those little kits like Perler beads and other ones), maybe a little cooking (they don’t like food much so we will see), drives over to the beach for Jake to dig in the sand while Michaela watches (she doesn’t do sand), Mark Hatfield Center at the beach, looking at the seals, Tillamook Cheese factory, museums, the $1 movies for kids, Library summer reading programs, camping and fishing for Jake (M doesn’t think she likes that) and whatever else we can find to do. We will probably do outings where we may travel a bit on 1 day per week, and small things the rest of the time. Each week, I will make a plan for that week and write it all down on a schedule, so everyone knows what’s happening (including myself and Rob as it’s a lot to remember). That’s the plan. I think it will work, but we will stay flexible if the kids get too tired, especially Michaela. WOW! First,I’m so excited that between the two of you, there’s so many hours for work. And, second, how very amazing it is that you can be the care providers to your niece and nephew. You will build so many great memories with them. It will be fun to read about all you do this summer. And I just bet you have to make a detailed schedule, another wow. It’s definitely a win-win situation. Because neither of them are ever left alone, you can imagine the juggling and shuffling that is done by everyone! Their older sister, who is in her mid-20’s helps out, as does Alissa, when they are not working. Their parents have a lot of time with them, too, of course. My mom comes one afternoon a week and plans to come along occasionally during the summer, to see all the grandkids. My aunt puts Jake on the bus one morning, and lends a hand where needed. It truly takes a team to keep those kids happy, healthy, safe, and learning new things every day! Now that Michaela’s done with school forever (yikes) she will work with a job coach who will try to find her a job for a few hours a week. That may take a very short time, or a very, very long time–no one can tell yet how that’s going to work exactly. In the meanwhile, it’s best to keep her engaged, and scheduled, so she doesn’t get in the habit of not being busy. She needs to stay used to not being home 24/7. My sister and brother-in-law feel that she should work in some way, money or not, hence the volunteering. She is very popular with the seniors at the center. It’s a perfect fit for everyone, I’ve been told. I’m looking forward to accompanying her sometimes this summer. I forgot to say ‘Congrats’ on her graduation. Yes, keeping busy is important. I have a good friend who has some challenges. She’s Down’s Syndrome but lives independently in her own apartment and has volunteered at the local hospital 25years or so. She’s in her mid60s. She’s independent but she does have a lot of family support. One thing that has helped keep her independent is that she’s always done ‘doggie daycare’ for family members. So they drop off and pickup their dogs every day during the work week and so some family member sees her twice a day. It’s one or two dogs a day. Just thought I’d share a little of her story. 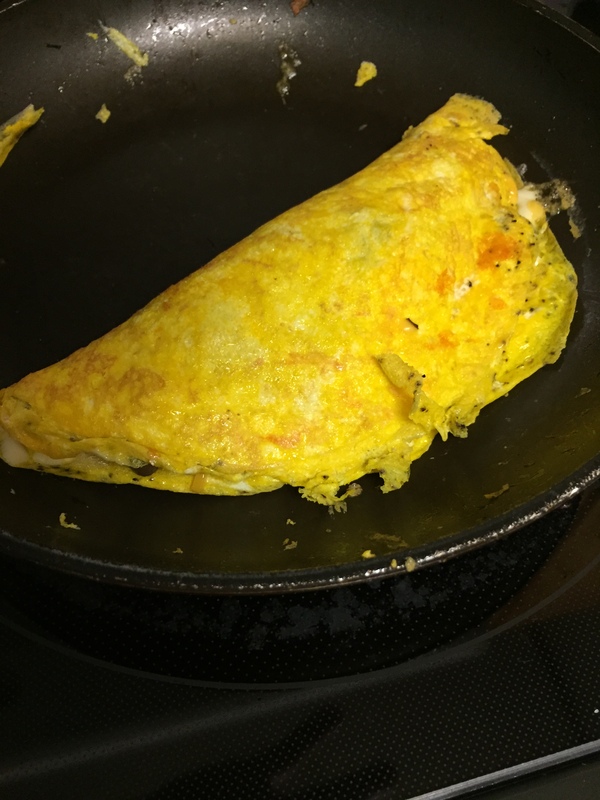 One of the first things I learned to cook at my Domestic Science class at school (in grade 6) was to make an omelette! After that, my step-father would ask me to make omelettes at home, during the weekends, for breakfast and they became my specialty! 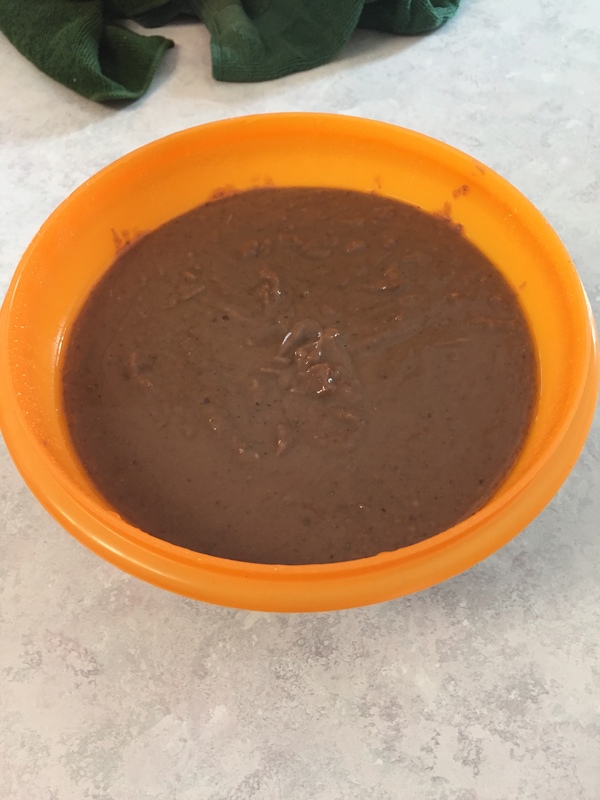 These days, I tend to make scrambled eggs more often than omelettes, but omelettes make a nice, quick dinner on days when I don’t feel like doing much cooking. I enjoyed the peek at your pantry shelves, all so nicely organized! 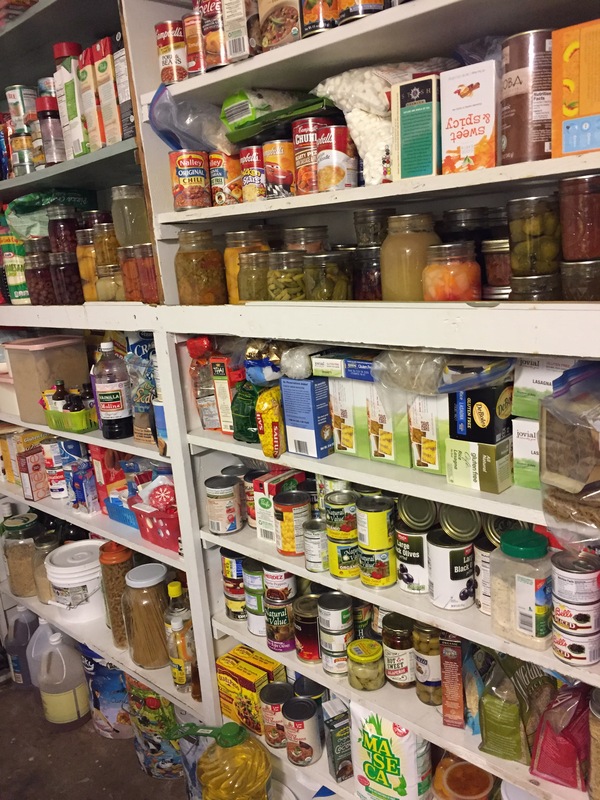 I need to tidy my pantry cabinets, too – I added a few things to it, the other day, and noticed that they’ve got a bit mixed up (I’m short, so, unless I get the step stool out, I tend to put new purchases where I can fit them on the lower shelves and not grouped with “like with like”). 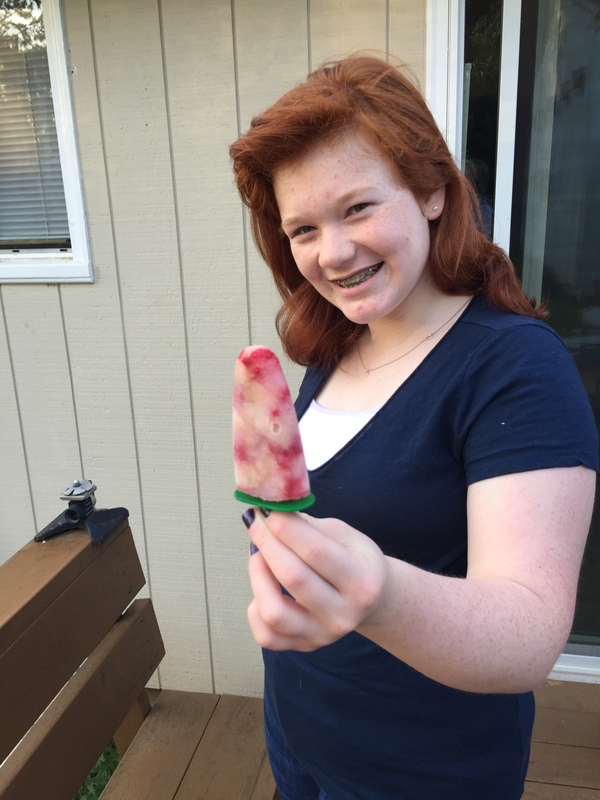 Yum on the homemade popsicles! 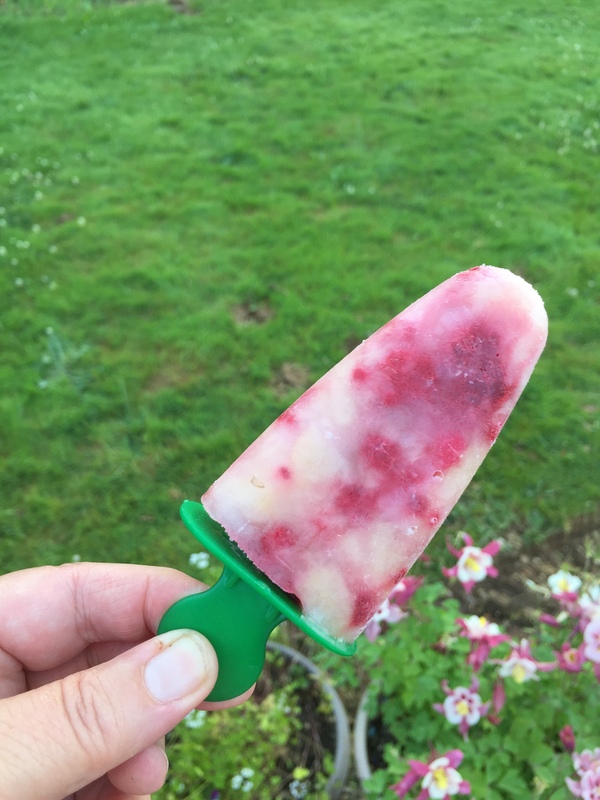 I, too, have a popsicle mold and usually make some in the summer – helps to cool off when it is 100F! Sounds like you’ve got a very busy summer to look forward to! I’m glad you and Rob got to have a date night before all that begins! Hope you are having a lovely Memorial Day weekend, Becky. Take care. It is so easy for me to lose items as well! Especially when someone else put them away and I don’t have a handle on where they put them! I was glad that I didn’t find a huge abundance of any one item that I had been just buying and buying! I need to clean out my pantry. Put it on the to do list for June. The ice pops look yummy. I need to pull out our molds. Yesterday was really hot. We could have used them. I’ve been using apple juice, purchased for 98c/container as well. That works great for when I’m in a hurry. The ice pops look so tasty – I think I would even just eat the mixture straight out of a bowl, or even over some ice cream or pound cake. You’ve sure got a busy summer lined up. All the kids will benefit so much from your hard work and planning though. Kudos to you all! They are really good. I’ve been snagging a few for myself. 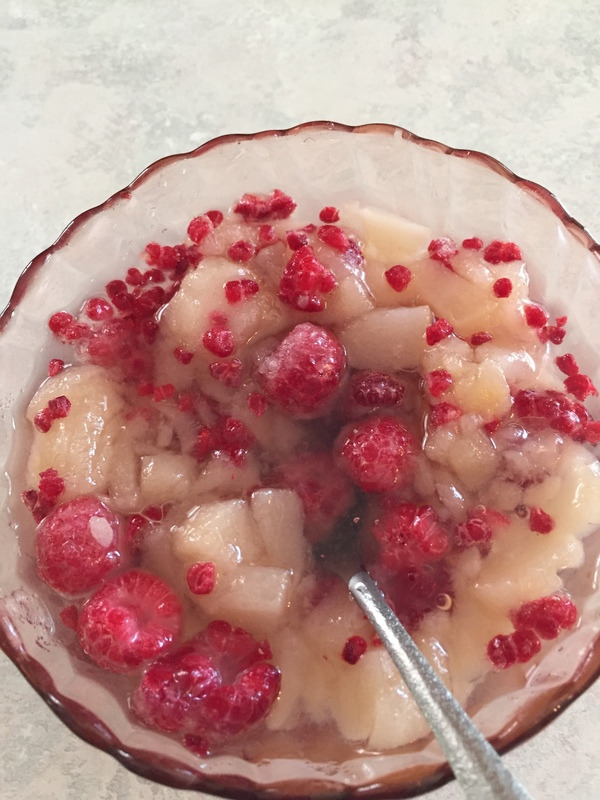 And, better yet, those pears that everyone used to love, and now want peaches instead….they are finding another use that people do want!